The mood at the state of Lower Saxony's annual garden party this week could not have been more upbeat. A country-and-western band provided the music, the beer was flowing, and racks of chickens were sizzling. But Christian Wulff, the state's conservative prime minister and Germany's most popular politician, was licking his lips at the prospect of an altogether different delicacy. "There will be new elections in Germany. This means a change in the content and style of politics," he said. "Then the hard work will begin. Our leader, Angela Merkel, will carry out the kind of economic reforms that were implemented in Britain over the last 15 years." Opinion polls show the conservative Christian Democratic Union (CDU) way ahead of Chancellor Gerhard Schroeder's Social Democrats (SPD), with Mrs Merkel poised to become Germany's first female leader. It was the CDU victory in the former SPD stronghold of North Rhine-Westphalia in May that prompted Mr Schroeder to call an early election. The first step towards that will be Friday's vote of confidence in the Bundestag, where the chancellor wants his own supporters not to back him - so that parliament can be dissolved. "One can voice confidence in the chancellor by abstaining in the vote; because this will enable new elections to be held," explained Franz Muentefering, the SPD leader and close Schroeder ally, this week. "Everyone must decide how he's going to vote. It's an individual decision for every MP." But this has met a mixed response from government MPs, some of whom are unhappy about the decision to hold an early election. Furthermore, a legal challenge could still derail the whole process. "There's a chance of 25-30% that the elections won't happen because the constitutional court stops the process - or the president does," explains Christoph Keese, chief editor of Welt am Sonntag newspaper. 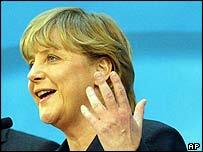 "There was a similar case 20 years ago, when Helmut Kohl got the Bundestag dissolved. The constitutional court ruled then that parliament must change the constitution if it wants to dissolve itself. But it hasn't done that." Still, the most likely outcome is an early election that produces victory for the CDU and defeat for the SPD. 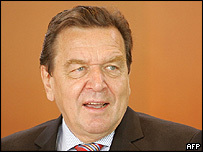 Chancellor Schroeder's party has been abandoned by the voters in a series of regional elections, in response to Germany's poor economic performance and unpopular reforms pushed through by his government. Above all, Mr Schroeder has failed to dent Germany's stubbornly high unemployment rate of around 11.3% - that is 4.7 million people, according to the latest figures. But his flagship reforms, cutting cherished welfare benefits, have not only harmed SPD support. They have also led many people to leave the party and form a new alliance with the former East German communists, the PDS. "People don't feel good about the Schroeder government, and the big decline in social welfare has led people to say: we need a strong left-wing party to help us," says PDS MP Gesine Loetsch. "We have our core voters in eastern Germany, plus former Social Democrats in the West who were disappointed but now have a new hope." The new alliance's trump card is Oskar Lafontaine - Mr Schroeder's former finance minister who went on to become his nemesis. "Red Oskar," as he is known, is a charismatic figure who could win lots of votes. The latest opinion poll gave the new left-wing alliance 11% support. That could also be a headache for the CDU, potentially depriving Angela Merkel of a majority in the Bundestag. So if the elections do go ahead it is going to be a long, hot summer of campaigning for all Germany's parties.